Swing Into Spring in Powder Springs! AddressThe address for this sale in Powder Springs, GA 30127 will no longer be shown since it has already ended. 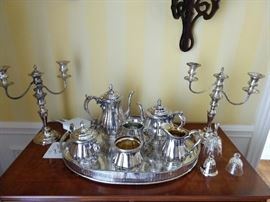 Always bear in mind that we're an estate sale company, not Neiman's. Honestly, that is about as simple and direct as we can make it. To be absolutely clear there is no warranty or guarantee of any kind for anything we sell. We don't sell on-line or over the phone so you decide for yourself, in person, if you want an item and if it will meet your requirements. Once paid for it belongs to you and you are responsible for transporting it to its new home. Gorgeous home in a quiet little cul-de-sac in Powder Springs, of all places - who knew?!? 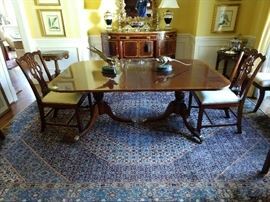 Lovely dining room, with James River Collection banded mahogany dining table, six Maitland-Smith side chairs, Hickory White sideboard, set of 6 semi-antique English hand colored botanicals, vintage Persian Bidjar rug, measures 8' 5" x 11' 10". Hickory White sideboard with pair vintage porcelain lamps, vintage Gorham silverplated 5-piece tea/coffee service on a Sheffield gallery tray, reflected in an Italian gilt wood mirror. Shoo gurl, get that BUGGGG off-a-me! 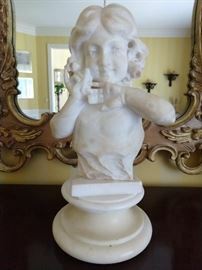 This carved marble lass seems to get a thrill out of handling a locust. She was a child of the depression, times were tough and, well, a girl's gotta do what a girl's gotta do - they sho' is good fried! Vintage Persian Bidjar rug, hand woven, 100% wool face, measures 8' 5" x 11' 10". 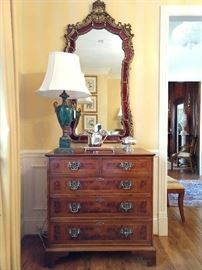 One of three burl wood chests, with pencil inlay, from Englishman's Fine Furnishings (S. Atlanta Rd.). 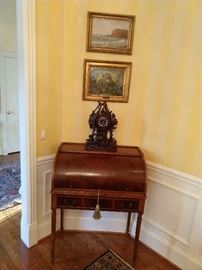 Antique English mahogany roll top desk, with hand carved Black Forest mantle clock. Close-up of the interior, just in case you didn't believe me. I've already searched all the hiding places, so no gold, Rolex or lost diamonds. Pity. 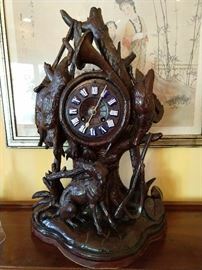 This German mantle clock is circa 1850-1880, with hand carved hunt trophies, round brass dial with Roman numerals on blue enamel, eight day movement, with half and hour strikes; oval base. Coastal landscape, by Wesley Weber 1839-1914, measuring 9" x 13". Original oil and impasto on board, by Emma Ciardi 1879-1933, triple arched ruins and gardens, measuring 14.5" x 17.5". Very nice PAIR of vintage Henredon Villandry French Louis-XV style walnut chests; they measure 34" wide x 19 1/2" deep x 24 1/2" tall. Custom cut glass tops for both pieces. Lovely collection of vintage/antique Chinese Rose Medallion china. The platter measures 11" long. The square plates measure 7 1/2", the pairs of plates measure 8 1/2" and 7" diameter, respectively. Pair of vintage Japanese school watercolors, gouache on silk, white herons/iris. Yep, here it is folks, the star of the Asian rose medallion constellation, THE urn, from the Kuang Hsu Dynasty - 16 1/2-inches of happiness (1875-1908). Gilt wood mirror, over vintage French oak nesting tables, with perfectly sized and cute-as-a-button hand woven Persian Bidjar. 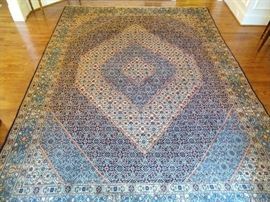 Vintage PersianLilihan Sarouk runner, measures 3' 4" x 9' 9". View from the master bedroom, upstairs, with a vintage Afghan Balouch rug, measuring 3' 8" x 6' 8". Art nouveau French gilt wood mirror, with mahogany smoking stand and vintage Persian LIlihan Sarouk runner, measuring 3' 4" x 9' 9". The Scarlett O'Hara view from the top of the stairs, down the the "Help" - that would be me. I'm expensive and have to work to keep me used to the standard of living I've become accustomed to. Plus, my babies need milk! Pair of antique English mahogany chairs. The backs are carved from a single board, not veneered. SO, you know they are not from IKEA. 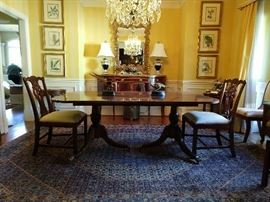 Beautifully wood paneled library, with hand woven Persian Heriz design rug, Maitland-Smith desk and chair. Pair of Maitland-Smith carved mahogany armchairs, pair of wonderfully carved marble urns, with matching stands. Built-ins in the library filled with collected treasures! One of a pair of Maitland-Smith carved mahogany armchairs. Close-up of the Persian Heriz design rug, measures 8' 11" x 10' 11"
French gilt wood mirror, pair of gilt wood candlestick lamps, pair of vintage Nippon vases on wooden stands, with full compliment of English brass fire tools, bumper and andirons. 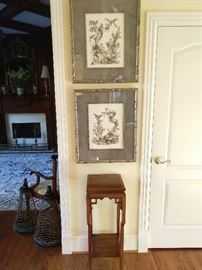 Better view of the marble urns, on stands, with pair of hand carved wooden Asian panels. 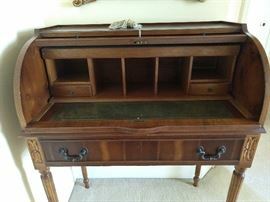 Maitland-Smith tooled leather topped writing desk, with silver leaf chair. Lovely Maitland-Smith silver metallic desk chair - very sha sha sha! Vintage Persian Ghum, hand woven, 100% wool face, measures 5' x 9' 1"
LOVE this gryphon desk lamp - the shade is extra yummy. BEAUTIFUL 4-piece Chippendale style banded mahogany bedroom set, with three vintage Persian Heriz rugs and original oil paintings. Vintage Persian Heriz rug, measures 6' 8" x 11'. This pic is a close-up of the banded mahogany detail. 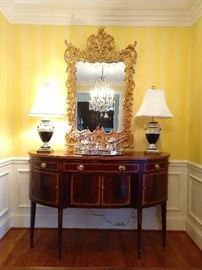 Gorgeous matching banded mahogany 8-drawer dresser, with matching mirror. Matching 3-drawer nightstand. Who says you can't have a one night stand in Powder Springs? Vintage Persian Heriz rug, measures 3' 3" x 6' 1".